A travelling of Varanasi is in incomplete without walk at Mystic Ghats of Varanasi and a boat ride in River Ganga. The Mystic beauty of Ganga Ghats in Varanasi can’t be visualized without roaming along ghats or a boat ride on the river. It was early evening a breezy and clear blue sky day of February.I happened a part of mystery that was happening there. Every evening thousands of visitors assemble at Dashashwamedh Ghat, to view the spectacle of evening Maha Aarti in Varanasi. Though this tradition itself may be thousands of years old, in the modern days the Aarti is a choreographed show with priests in traditional Indian clothes using huge deepams and mashals or Cressets, moving to the tune of melodious Aarti and Bhajans. The Ganga Ghats of Varanasi are mystical and magical place.These Ghats are a place where the dead and living play roles at same time. A last breath of salvation at the Manikarna Ghat is well deserved for. So here it is almost a beauty to watch death at burning pyres. The dead body cremated here, in accordance to the Hindu rituals, would attain moksha and be relived from the cycle of birth and death. A last breath of salvation at the Manikarna Ghat is well deserved for. These Ghats are a place where the dead and living plays role at same time. Pilgrims come here to wash away a lifetime of sins in the sacred waters or to cremate their loved ones. So death here is almost a beauty to watch. So one fine morning I was in Varanasi. I decided to take the evening boat first. Hired un shared boat only for my enjoyment. This boat ride costed me Rs 300:00. I took my seat comfortable, and took my SLR canon ready to catch the magic. Let’s start virtual tour of of the Ghats the most mesmerizing beautiful journey.Few lines are not enough to describe these moments.The boat was floating freely down stream of river along with many other boats. The boats man was singing a folk song in pure eastern language tone. Sea guls were flying high, some v close to water surface in search of small fishes for their food. As the boat started receding from the bank, from a distance, all the Ghats forms a crescent. It is fun to compare the Ghats, how one looks so different from the other, though they stand next to each other. Looking at the Ghats, floating in a boat on the Ganges was making me more and more relaxed.I was totally lost in magic and mystic atmosphere that enveloped me.It is not possible to narrate this beautiful trip in few lines. The Maha Ganga Aarti Ceremony at Dashashwamedh Ghat. The last and most spritul events were awaiting me. That was Maha Aarti of Ganga Ceremny at Dashashwamedh Ghat.The Sun God was getting low near sky and Ganges water line.The sky was turning from blue to orange.Light at various ghats and buildings were letting on. My boatman turned direction of boat towards “Maha Aarti of Ganga” Ceremony place. I saw the Aarti from my boat anchored in the river. 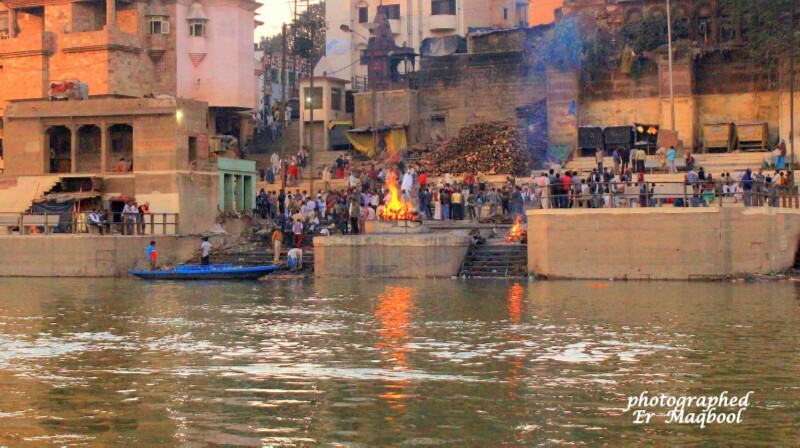 Maha Ganga Aarti stared at 6:00 PM in the evening after the sunset for around 45 minutes. Devotees use to come to see the Ganga Aarti at least one hour before. The ceremony initiates with the blowing of a conch shell and ringing bells. The priests’ waves incense sticks and hold up large flaming lamps while chanting mantras to the goddess Ganga. The priests’ movements are synchronized and the crowd is quiet during the ceremonial acts.All the priests who have to perform the Aarti, wear same cloth, the dhoti and kurta which is tightly bind with a long towel. After completion of this Maha Ganga Aarti, I was hungry, so decided to have a dinner.I left the Ghat around 8:00 pm. After dinner I went to a Thandai Shop. After drinking Thandai, I bought famous sweet called Khirmohan and Chamcham ended with chewing famous Banarsi Paan. This ended my full of fun and memorable day in Varanasi. I enjoyed a boat ride and evening charm of Ganga Ghats and the Traditional Maha Ganga Aarti. The memories of magical Boat ride and Mystic spiritual Maha Aarti of Ganga has been etched on my heart for ever. My camera too was full of those memories.